I attended the Milwaukee show this past weekend (Thursday night through Saturday) with a friend and fellow mqresource member “Beema”. While there we ran into two other fellow members, dzinr1 Rebecca (shown at left below) and Sue suek. It was wonderful to meet them and I had a totally awesome time. I took a wholecloth design class from Karen McTavish that I’m totally stoked about. Now, just to find time to finish it! You can see pictures from the show on my shutterfly site at http://milwaukeemqto…shutterfly.com/ . There are pics from the fashion show/auction/quilts of valor presentations on Thursday night. What a fun night that was! 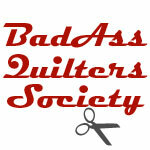 We quilters are the coolest people! Friday night’s karaeoke was a blast. There are a few videos on facebook of Claudia Pfiel that are just hilarious! I just fell in love with Claudia. All the teachers were so friendly and approachable. I loved every minute. Thanks LynnEl for coming with me. Below are also pics of Sue Patten, Irena Bluhm and Karen McTavish. I have a quilt for Grace on the frame that should be finished tonight or tomorrow (depends on how much housework I need to catch up on tonight) and next is a quilt for Cheryl in Shelbyville! I’m scheduling some time for me to get some quilting done – probably after Christmas. I’m totally motivated after going to this show to get two quilts done before next year’s round of shows. Makes me wish I’d gone along, maybe another time it will work out. Glad you two had a wonderful experience. Looking forward to our next get-together and hearing all about what you’ve learned! Love those qilts, glad you had a lovely time. Wish I could sew, tho. Would you be so kind to leave a comment on my BLOG ONLY (no emails), for the Miracle Makeover fund drive. Charlie, 8 yr. old, & his story are fabulous. Every comment brings us a $1 for the next person that will be sponsored. Please share this with your freinds.